I recently read a fascinating story in a book called The Grace Outpouring by Roy Godwin and Dave Roberts. (Thank you, Chris!) The book is the story of a retreat center in Wales called Ffald-y-Brenin. The Lord led the people there to bless, not just the people who lived around them, but also the land. One of the things they prayed was that the sheep in the farms around them would be strong, healthy and productive. 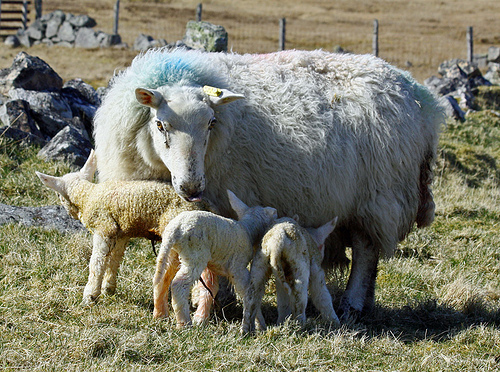 One of their neighbors told them how stunned he'd been by the number of quads and triplets being born to his ewes. His normal hope was for many twins. Another thing they saw as they called on the name of Jesus was the spontaneous opening of water springs that had been dry for many years. As they prayed blessing on the people, businesses started to take off, the farms prospered and the valley began to see both physical and spiritual improvement. Blessing others can be a source of releasing the power of God into their lives. We see in Luke 10 that the people we're blessing don't have to be Christians in order to receive something from the Lord (verses 5-9). But it will open them up to the good news. Christians are known for being judgemental. What can we do to change this? We can speak blessing ovre them. Luke 10:5 tells us to speak blessing when we enter someone's home, and if a person of peace is there, they will respond. What can this look like in a modern-day, Western context? I agree with Felicity about the sheer power of speaking blessing into people’s lives and situations. We constantly have choices in our daily lives. Will we be brave or afraid? Will we speak blessing or curse, peace or upheaval. Will we treat people with grace or with judgement? I’m looking into my own heart here. I will have fresh opportunities tomorrow. Will I choose wisely? Will I think mostly about myself or about others? Next Next post: How do we recognize a person of peace?